Bexhill College’s sports academies have been busy of late. Both the men’s football second teams played on Wednesday, last week. The blue team maintained its 100% record with a dominant 4-1 win against Cardinal Newman Sixth Form College. David Chasumba netted a hat-trick and Josh Pool got the other goal. The white team, however, was beaten 3-1 by East Sussex College Eastbourne. The whites will seek to win all their remaining three matches this season to finish as high up the league as possible. Bexhill College’s badminton academy is through to the last 16 of a national competition following a 6-4 victory away to Chichester College. The team will next face Truro and Penwith College, from Cornwall, for a place in the quarter-finals. 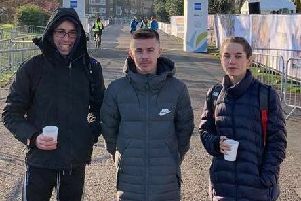 College students Harmony Cooper and Jake Bourne successfully competed in the Sussex Schools’ Cross-Country Championships at Waterhall, Brighton. Bourne finished 23rd, while Cooper’s seventh place was good enough to qualify for the next round. The two runners will represent the South East in cross-country at the AoC National Championships in Nottingham this April. Before half term, the women’s basketball academy will play away to Hackney College and the women’s volleyball academy will be away to Tresham College in the quarter-finals of their respective national cups. The men’s volleyball academy will be home to Hills Road College in their national cup quarter-final.